The show opens at The Miz & Maryse's home in California. They are going over their upcoming road schedules. Maryse wants to see if The Miz has any time off in the near future. She suggests that they go on a honeymoon together. Because of their work schedule, The Miz has not been able to take Maryse on a honeymoon, since they were married three years ago. A clip is then shown of a conversation between Eva Marie and Maryse. They are discussing this very issue. As it turns out, Eva didn't get the chance to go on a honeymoon either because she had to work a live event, the day after her wedding. Both women think they could should go on a joint couples vacation. Back to Miz and Maryse, "Mike" agrees to ask for a few days off so that Maryse and him can go on a honeymoon. He quips that the Intercontinental Championship can wait. The Bella's are now shown in New York City. They are headed to a pet agency to meet a pet agent named Loni Edwards. Both Nikki and Brie talk about their social media presence and how this can be a great career choice. Nikki is told by Brie that Natalya is going to be meeting with them at the agency. It turns out, Nattie requested coming along when Brie told her that The Bella's dogs 'Winston and Josie' might get representation. Natalya's coming along to see if her cat '2Paws' can get represented by the agency. The Bella's meet up with agent Loni Edwards for lunch. Brie informs Loni that her friend Natalya will also be joining them later....Loni pitches all the different types of sponsorship deals, Winston and Josie can get through their agency. When Loni starts discussing potential book deals, Natalya arrives and joins their table. Nattie jumps right into the conversation and starts pitching her cat to Loni. She shows her pictures of 2 Paws wearing designer items. Natalya calls her cat "Iconic" and that 2Paws listens to Jay Z...... The Bellas start getting irritated and try to shift the conversation back to their pets. Nattie continues the pitch for her cat and talks of a potential production company named The Lions Den. The Bellas leave at the end of lunch but Nattie stays with Loni. Cringe worthy stuff and on this show, that's saying something. We are now at Smackdown Live in Birmingham, Alabama. A match between The Miz and Dolph Ziggler is shown on screen. While Maryse talks about getting news that Mike and her will be getting 5 days off at the end of the month. Maryse says that they will be going to Exuma in the Bahamas together. Eva Marie and her husband Jonathan will be coming along as well. At The WWE Performance Center in Orlando. Nikki Bella is training for her in ring return. Nikki does a WWE.com interview, talking about her comeback attempt. Nikki's goal is to return at SummerSlam. Nikki says that this is the week, that she will find out if she is going to be cleared to return. The Miz, Maryse, Eva Marie and her husband are on a jet, They are flying over the Bahamas. Maryse tells them about an island in Exuma that has pigs on it, and how people actually swim with them. Maryse thinks that it could be a romantic thing to do. The Miz jokes about it.... Later on, The couples arrive to their rented honeymoon beach house. Miz says that he feels like he is back on The Real World. The men have set everything up at the house and have hired an in-house chef. When Maryse asks The Miz, what he has planned. Miz says that he plans on eating, drinking and swimming. Jonathan and Mike high five about going spear fishing and cooking fish on the grill. Miz also invites everyone to be a part of his fantasy football league draft. Maryse doesn't seem pleased with her husband's plans. She still insists on swimming with pigs, as something she really wants to do. Maryse demands romance from The Miz. Backstage at Smackdown Live in Buffalo, New York. Natalya tells Renee Young about her cat getting it's own line of shirts. Nattie tells Renee that '2Paws' now has 82 thousand followers on Instagram. Renee thinks that her dog 'Blue' is marketable as well, and wants to make him a star. Renee thinks that her dog is cuter than Nattie's cat. She tries to get Daniel Bryan's opinion on it but he pretends that he didn't see or hear them and walks away. Back to the couples in Exuma, Maryse & Miz are preparing their outfits for the day. They argue about The Miz's upcoming fantasy draft. The Miz has Cleveland Browns attire set up specifically for the draft. Maryse can't believe that her husband is actually doing a 12 team fantasy football league draft during their honeymoon. Mike says that it won't take long and that it's not a big deal. The Miz promises that he is going to make this the best week of Maryse's life. Back at Smackdown Live, Nikki Bella tells John Cena that she is going to have a physical in the ring today. Nikki is hoping that she passes the physical and is cleared to return. Brie Bella is also on hand to support her sister. After the physical, Nikki teases Brie into thinking that she didn't get cleared. She reveals that she has and they celebrate together. Nikki then tells Brie that she won't know which brand, she will placed on for another week. Natalya is now in Pittsburgh. She goes to visit Rosa Mendes and brings gifts for her daughter. Rosa's husband Bobby has been helping design shirts for Natalya's cat. Nattie tells them she has sold over 500 shirts. Bobby suggests marketing '2Paws' as a hip hop figure. He suggests 2Paws getting a gold tooth. Back in The Bahamas, The couples have gone out to dinner together. Eva and Maryse are disappointed that their husbands are more interested in doing other things than romancing them. The Miz is constantly checking his phone for updates on his fantasy league. When dinner ends, On the car ride back to the house. The Miz is hyped talking about his draft. Mike has the second pick and talks about drafting David Johnson if Antonio Brown goes first. Nikki Bella is at the performance center in Orlando. She is meeting up with Head Athletic Trainer Brian Duncan. They discuss Nikki's finisher 'The Rack Attack' and whether or not, she can still use the move. Nikki says that her surgeon suggested that she no longer use the move, because of the wear and tear on her neck in executing it. Nikki is sad that the move is being retired. Back to The Bahamas, The Miz is on his laptop drafting his fantasy team. Maryse comes down the stairs in a robe and tries to entice him but Mike doesn't give her any attention. He's happy that he just drafted his #1 Wide Receiver. Maryse wants Miz to join her in the bedroom but Mike says that he will wake her up later. At the performance center, Nikki Bella trains with Bayley in ring. Nikki wants to have a new in ring style and says that she will be working with MMA fighters, to try and incorporate a new submission styled finisher. Dean Ambrose, Renee Young and Natalya meet up at a bar in New York City. Natalya and Renee end up getting into an argument, when Renee reveals that she is using Nattie's shirt designer Bobby for her dog Blue. Natalya gets upset at Renee for copying and stealing her ideas. Nattie calls Renee unstable and leaves her. The couples head to the beach and the men ending up going into the water with the sharks. Eva and Maryse are frightened and are not happy, that they are once again being ignored. Back in Orlando, Nikki Bella trains with MMA fighter Shayna Baszler. Shayna was introduced to Nikki by Natalya and she is along for the training here too. Nikki works on submissions during the session. Baszler uses Nattie and shows Nikki several potential holds. Nikki tries some but says that she is uncomfortable and unsure if this new style fits her. The next scene has Natalya back in New York City. This time, she is with Brie Bella. Natalya tells Brie about Renee's attempt to copy her marketing idea with her dog Blue. Brie tells Nattie, that what Renee has done to her, is similar to what Nattie did when she intervened in The Bella's lunch meeting with the pet agent. Nattie laughs and agrees that she did the same thing. Brie jokingly suggests that Nattie should prank Renee by getting Dean to wear a 2 Paws shirt. Back in Exuma, The couples are on a boat now. Maryse and Eva are upset that they have spent the whole day doing what their husbands want. Mike and Jonathan now plan on spear fishing. Maryse tells the men that she doesn't want to kill animals and that she doesn't even eat meat. The boat runs out of gas and they have to head back to shore to refill the tank. The Miz tries to lighten the mood and make Maryse laugh by reenacting scenes from Forest Gump but Maryse isn't biting. After the boat's gas is refilled, Mike and Jonathan go spear fishing and have no success. Maryse relents and says that they have spent 6 hours doing this and that she might as well try. Maryse and Eva put on swim caps, head under water and compete against their husbands. Maryse gets a lobster bare handed without using a spear. The women end up having a good time on the boat with their husbands. At Smackdown Live in New York, Natalya and Renee Young are backstage getting their makeup done. Nattie tells Renee that she hates dogs and that cats are better. R Truth is dragged into the conversation. I guess he somehow made his way from Raw for this. Renee tells Truth about Nattie's comments about dogs. R Truth sides with dogs in the argument and tells Nattie that "Cats kill babies"..... Truth's logic is that every scary movie has a cat in it. Renee says that dogs are better than cats, because cats can't protect your house. Nikki Bella has just finished training at The Performance Center. She gives her sister Brie a call. They talk on speaker phone. Nikki tells Brie about changing her in ring style and how she doesn't feel right about it. Brie encourages her to not settle and to come up with something that best suits who she is. Back to Miz, Maryse, Eva and Jonathan. They all go on a tour with the captain of Exuma water sports. Mike has delivered what Maryse wanted all along and the couples end up swimming with the pigs on the island. Back in Orlando. Nikki Bella is training again with Bayley. She is working on several different moves. The show ends with Nikki teasing her new finisher, which she says utilizes her thighs. Nikki passes on revealing it and says that everyone is going to have to wait. This was filmed like 10 months ago. So the tease doesn't make much sense unless this is for the limited crowd who only watches this show and not the WWE. 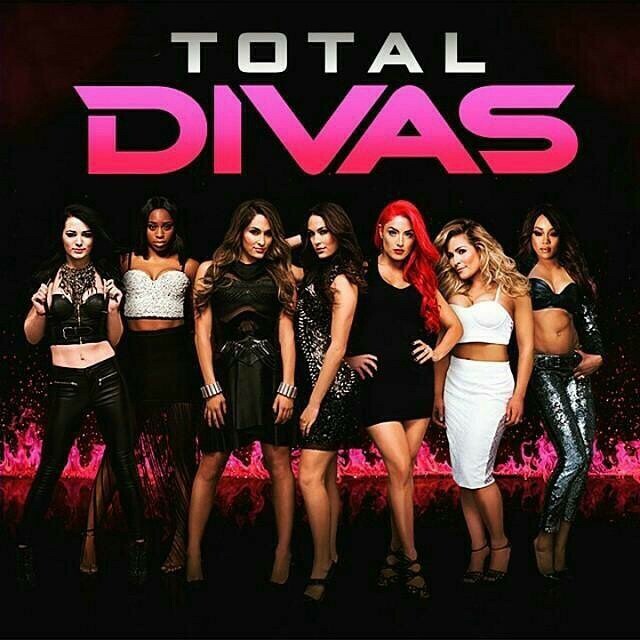 Next week's show is the season finale of Total Divas. In the teaser video below for next week. Eva Marie's suspension is covered. Also teased is Brie finding out that she is pregnant and the SummerSlam show from last August.